This low voltage supply is useful for powering a variety of 12V (nominal) DC devices. An improved second-generation power supply project is shown below. The power supply is perfect for powering Ham Radio QRP rigs, VHF radios, CB radios and car stereos. It can provide regulated power at up to 4 Amps at 13.8 Volts for a total of 55 Watts. The output voltage is kept steady with an adjustable regulator circuit. The first version of this supply started with an old dead power supply that I had in my junk box. The power transformer, filter capacitor and frame were salvaged for this project. The power supply can also be built from new parts. The circuit uses few parts and is fairly easy to build. The power transformer converts 120VAC into 38VAC center-tapped. This is fed to the two Schottky diodes which full-wave rectify the AC into DC. 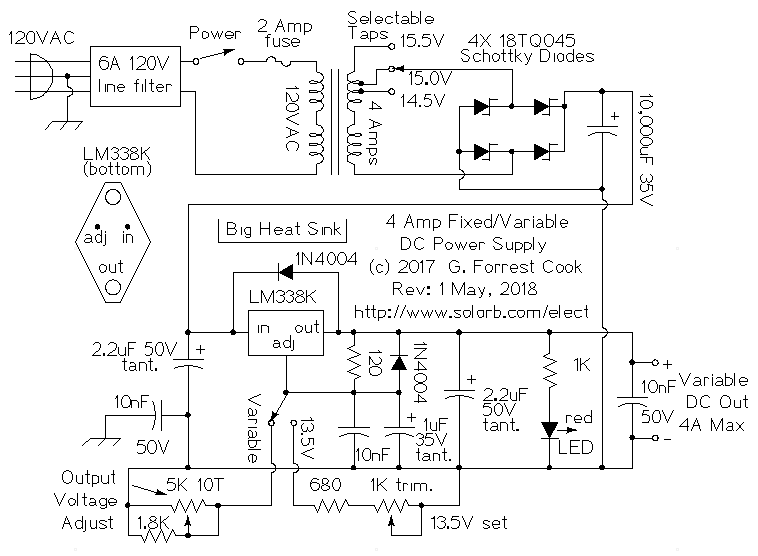 The Schottky diodes have a lower voltage drop compared to regular silicon diodes, this provides a bit more headroom for the regulator circuit. The 12,000uF capacitor filters the ripple from the DC supply and the 100nF capacitor improves the high-frequency bypass characteristics of the 12,000uF capacitor. The regulator configuration was inspired by the applications notes for the LM309 regulator in the 1979 Motorola linear circuits databook. By adding a high-current pass transistor, a voltage regulator's current capacity can be greatly boosted. In this circuit, the regulator was changed to an adjustable type (LM317L) and a high-gain PNP darlington pass transistor (2N6052) was used. The LM317L voltage regulator changes the base current on the 2N6052 in order to keep the output voltage at the regulated voltage setting. The 150 ohm resistor across the 2N6052 emitter and base terminals provides operating bias for the LM317L regulator IC. Different brands of 2N6052 may exhibit different gains and the value of the resistor may need to be adjusted. The 10uF, 35V tantalum capacitor filters the input to the LM317L regulator, the value was selected to produce fast respose to large changes in the output current, while preventing oscillations in the regulator. The two 100nF capacitors on the output terminals bypass any stray radio frequency energy to the chassis ground. Note that there are two grounds in this device and they are isolated from each other. The ground from the AC input is connected to the chassis and the output bypass capacitors. The DC negative lead is also considered a ground and is isolated from the AC ground. The two grounds may optionally be combined by connecting the negative output lead to the chassis ground. This circuit was built on the chassis of a Standard Power Supplies model SPS40-12 which had a defective regulator circuit board. The chassis, heat sink, power transformer and 12,000 uF capacitor were all were salvaged from the original device, everything else was removed. 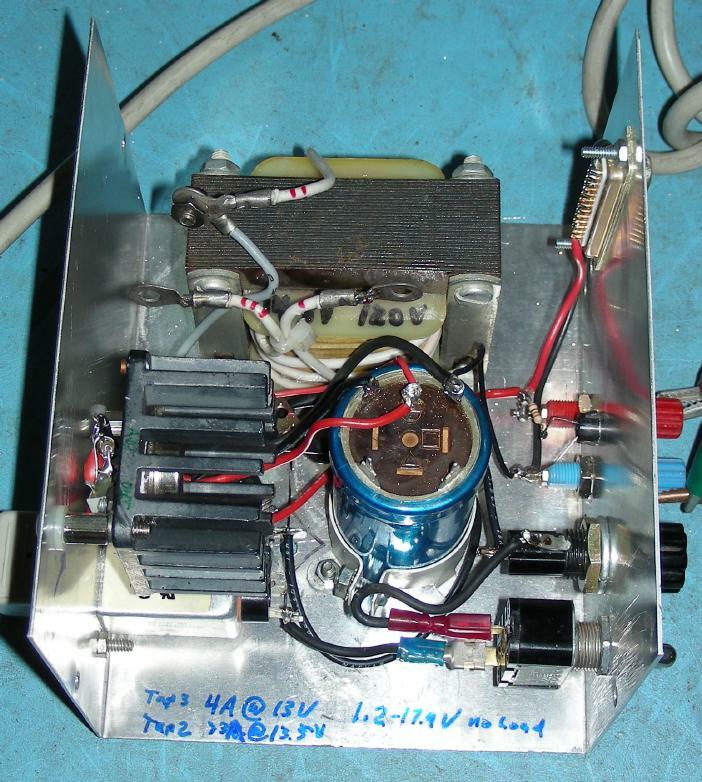 The rebuilt power supply chassis was mounted in a metal box. The AC input connector, AC fuse, DC output terminals and chassis ground connection are monted on the box. The 2N6052 transistor was mounted on an aluminum bracket that thermally couples to the larger chassis heat sink, it was attached with screws and thermal grease was used on all of the metal junctions. The 2N6052 should be electrically isolated from the heat sink using a mica insulator and plastic shoulder washers. Most of the small parts were wired point-to-point under the 2N6052 transistor, the circuitry could also be built on a perforated circuit board. The 10uF, 35V tantalum capacitor on the input side of the LM317L is critical for preventing oscillations, if you can't find a tantalum part, use a 10uF 35V electrolytic capacitor in parallel with a 100nF monolythic or ceramic capacitor. With no load attached, monitor the output voltage with a DC voltmeter and adjust the 5K potentiometer until the output reaches the desired voltage. When the load is connected to the supply, the output voltage should be fairly stable as long as the current is kept under 4 Amps. The above schematic and photo show an alternate and improved circuit for a regulated DC power supply. The output voltage is selected by a SPDT switch. In the fixed setting, the voltage is set to around 13.5V (or 13.8V) via the 1K trimmer. In the variable setting, the voltage is set by the 5K 10 turn potentiometer on the front panel. The variable output voltage range is 1.27V to 16.7V. This is another junk box special that was built almost entirely from surplus parts. 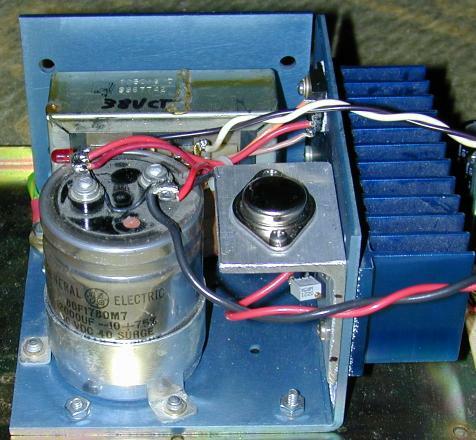 The power supply uses a single-ended power transformer that feeds a Schottky diode bridge rectifier. The rectified DC power is smoothed by a 10,000uF electrolytic capacitor. The filtered DC voltage is regulated by an LM338K IC, which can work at up to 5 Amps of current. The supply's maximum current is limited by the capabilities of the transformer. A larger heat sink should be used for the LM338K if the supply will be used at the full 4 Amp current for extended periods. The 1uF tanalum capacitor in parallel with the 10nF disc capacitor on the LM338K adjust pin provides a small amount of ripple rejection and also reduces RF noise from the supply when the supply is driving commutating loads such as a DC motor. The two 1N4004 diodes protect the LM338K from destructive reverse voltages which can occur if the supply is connected to a charged capacitor or a rechargeable battery. The 10nF capacitor on the output pins reduce any RF feedback to the regulator and the 10nF capacitor between the negative output and the AC ground bypasses RF to ground. These bypass measures help to stabilize the power supply when it is powering devices such as ham radio transmitters. The power transformer used in this supply was a surplus unit. The selectable taps were added to the transformer by installing two turns each of 14 gauge insulated copper wire around the existing transformer windings. The extra windings boost the transformer voltage up by around 1/2 Volt per tap. This helps to increase the maximum regulated voltage that the supply can produce under load. The 15.0V tap provided the best compromise between regulated voltage and heating of the LM338K when the supply was set to 13.8V.